The Offers object allows you to efficiently manage the entire offer process. This includes basics like associating a Listing with an Offer, along with buyer and seller records, as well more complex functions such as the ability to create a counter offer, add an addendum, notes and more. 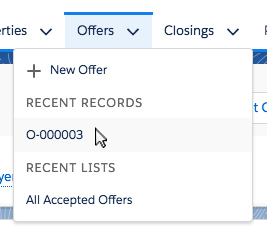 Managing Offers with Propertybase also allows you to quickly create a Closing using existing record data. Offers are located under the offers tab at the top of the page. You can also access individual offers by clicking the drop down arrow. Similarly, new Offers are created by clicking New Offer using the drop down arrow. 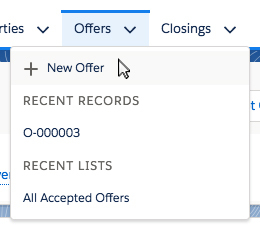 When you open an Offer record in Propertybase you will see actions at the top of the page. Here you can perform a variety of actions, like accepting the Offer, canceling the Offer or creating a new Closing, based on the record selected. Immediately below actions you will see Offer details. This section displays the most relevant data, like offered amount, potential buyer and target close date, so that you can reference the information quickly and regularly. Below Offer details is the Offer path. This is a visual representation of a given Offer's current status. You can update this by clicking any stage and selecting “mark status as complete”. Underneath the Offer path is a set of tabs. The first tab, Details, displays additional Offer information for a given record. This includes everything from listing price, offered amount to amendments and internal notes. Under the Related tab, you will find a list of objects containing records that relate to the current Offer record. The Related tab is one of the most powerful features of Propertybase. Here you can cross-reference data and view relationships between separate objects. For example: If you have previously created a Closing record on the Listing associated with the current Offer, you will be made aware of that here. In addition to the primary features listed in this article, Properties and Listings have access to secondary features like activity and chatter. These are located on the right side of the screen. Under the Activity tab, you can perform a variety of tasks associated with the current record. These tasks are then tracked and displayed under Past Activity. Chatter is a miniature social network within Propertybase, specifically for your organization. Chatter shows all activity within the organization with the option to like and comment on each post. This is Part 9 of 12 in our Getting Started with Propertybase series. We recommend you continue to follow along, in order, as we walk through the entire Propertybase process, from lead to close. Now that you understand the basics of managing Offers in Propertybase - it's time to learn how to create a closing using existing data stored within an Offer record. Click here to learn about Managing Closings in Propertybase.